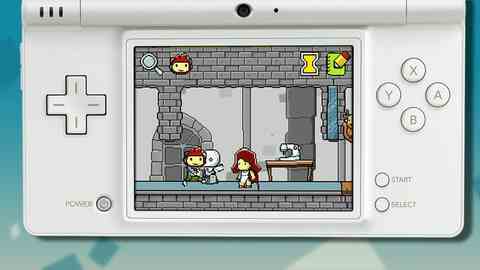 Scribblenauts was magic: solve challenges by conjuring forth objects. Type in a noun, and the game would bring it to life – with many of its inherent characteristics intact. Toasters would toast, vampires would drink blood, economists would wear little suits and ties and tell you that you should have had a pension in place, like, a decade ago. It just wasn't very good magic. The game's challenges tended towards the dull (make a packed lunch? I can summon fire trucks and zombies), the objectives were often quietly confusing, and the behaviour of some of the in-game animals you were able to create could very occasionally be a bit weird. Sometimes my T-Rex would eat everybody, for example, and sometimes he wouldn't. I have no use for a T-Rex like that. Input was the biggest problem, however. Scribblenauts' controls were only marginally less awful than that time Arnold Schwarzenegger backed over his favourite dog while taking his Hummer to the carwash. (This really happened.) Forcing all interactions – character movement, object manipulation – onto the touch screen meant that messing about in 5th Cell's magical universe could be claustrophobic and clumsy. Playing Scribblenauts was often a bit like that scene in Michael Crichton novels where scientists are faced with a material so toxic that they can only manipulate it by putting their arms into rubber gloves inside a little glass cube. Except it was like doing that underwater, with your shoelaces on fire, while an earthquake shakes the entire building. In open-air challenges it wasn't too much of a muddle, but when Scribblenauts moved indoors, you didn't want to be there. Tables and chairs would fly about, rope and glue would attach themselves to everything, and there wasn't even any place left to dump the fire truck or zombie you'd just spawned. Could you make a packed lunch under those conditions? Guess what? Super Scribblenauts fixes all that. You now have the option to control Maxwell, your avatar, with the d-pad, leaving the stylus and touch screen free to handle everything else. It's transformative. Suddenly, Scribblenauts isn't awkward and irritating as well as intermittently wonderful. Suddenly, it's just intermittently wonderful. The controls aren't the only things that have been fixed this time around. There's a new hint system in place, allowing you to buy clues for the rare occasions when the thrust of a challenge is a bit unclear. When asked to create an animal similar to a vampire, in other words, you'll be able to discover that it's the blood-sucking rather than the nice outfit the game's currently preoccupied with. Really, though, you should have worked that one out for yourself. The challenges themselves have been given a bit of an airing, too. They can still be the weakest element of the game, to be honest, but the quality has certainly improved, with clearer objectives and a tendency towards slightly more imaginative scenarios. A lot of them are quietly witty, in fact. Tasked with giving a boy courage, you'll find a machine gun will do the trick. Asked to coax a lion to sleep, and you can either hide the sun behind some clouds or shoot the beast up with tranquiliser darts. Those would have been stand-outs in the original game and here they're both offered up in the first 15 minutes.